The width of your headrail. 2 most common width are: 1" or 1.5" width. As long as these 2 elements are confirmed, the rest of the differences are NOT critical. You don't have to buy exact looking part for the repair. Compatible parts would work fine. For example, the following tilt mechanisms don't look the same. But they are compatible since they are all: 1" High, 1.5" Wide, HEX hole. White Plastic Body. Metal Gear & Shaft. 1/4" modified HEX shaped hole with Notch. Headrail size: 1.5" x 1"
Gray Plastic Body. Metal Gear & Shaft. Wand Tilter for Mini Blind,1.5" x 1". HEX Hole. White. White Plastic Body. Metal Shaft. Plastic Body, Metal Shaft, Hook & Sleeve included. 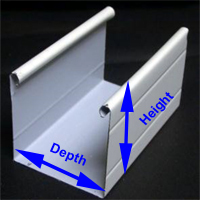 Headrail size: 1" x 7/8"